So you spent the winter working hard. You exercised consistently, you were careful to eat healthier foods and you watched your portion sizes. But Summer, in spite of all the fun and relaxation it brings, can be tricky and deal us a cruel blow when it comes to our health and fitness goals. Have you noticed the scale creeping up a little over the last couple of weeks? If so, you are not alone. Summer is a very easy time to overindulge. BBQs and pool parties are popping up everywhere. If you’re trying to maintain or lose weight, the summer can be a challenging time to stick with your goals. Remember that bad habits creep in slowly. Perhaps you are skipping your workouts a couple days each week, because ‘You have so much to do.’ Or maybe you have been indulging in unhealthy food or drinks a little more frequently when you are with friends. It happens-little by little. It happens one small choice at a time. But those choices add up fast. If you realize that you have been slipping up, it’s not too late to turn around and get back on track. Really! There is still plenty of Summer left for you to regain whatever ground you might have lost and get back to awesome. 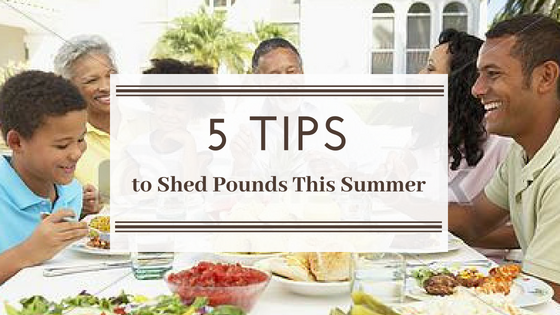 Here are 5 common reasons that people gain weight in the summer and how to remedy them. Disrupted sleep cycle. Summer brings with it more daylight and longer days. This extra sunshine can cause our circadian rhythms to change which causes us to sleep less. But if we don’t get enough sleep, our bodies will respond by packing on a few extra pounds! The solution? Be diligent to get at least seven hours of sleep each night. Baby, it’s hot out there! When it’s hot and humid, we tend to move around less. Our energy is lower and besides, who wants to sweat even more, right? But the less you move, the slower your metabolism is and the fewer calories you will burn. Be intentional about keeping up with your exercise. Find indoor exercise alternatives like boot camp classes or maybe even take up swimming. Just keep moving. On the road again. Summer means travel and travel means healthy eating just got harder. Eating on the road presents big challenges if you are trying to eat clean. Before your summer trips, brainstorm some ways to reduce the amount of fast food that you will consume while you are away. Consider packing a cooler with hummus, nuts, lean proteins sources like chicken, fresh fruit and raw veggies. Cookouts! Ahhh…summer cookouts, parties, family reunions. All this spells danger because the food at these festivities is usually about as unhealthy as you can get. Look for grilled vegetables, fresh fruit and lean cuts of meat. Fill up your plate with foods that are high in fiber and protein that are going to make you feel full for a longer period of time. Fresh whole vegetables are among the best sources of fiber such as broccoli, Brussels sprouts, kale and cauliflower. There are countless ways to eat healthily at a barbecue, and if you’re the host, you have a tremendous amount of healthy and delicious options to choose from while planning your menu. Click here for a few of my favorite healthy menu options for your summer barbecue. Lack of Hydration – Since we continuously lose water through urination, our skin through perspiration or sweat, even through the process of breathing, it’s critical we replace this important essential nutrient regularly each day. Start your day first thing in the morning – before anything else, especially coffee – with a large glass of fresh water to rehydrate your body and your brain after your night’s fast. Continue to drink water regularly throughout the day. Recommendations vary on the quantity of water we need, but drinking ½ your body weight in ounces per day is the ideal. The easiest way for me to remember to drink more water is to always have a full water bottle with me – at my desk, in the kitchen and when I leave the house. At BBQs, watch your intake of wine coolers and sugary drinks. Some of those coolers can have have high amounts of sugar which contribute to weight gain. Instead if you still want to enjoy alcohol go for seltzer or club soda and vodka instead with a squeeze of lemon, lime or other fruit. Don’t let the summer undo all the hard work you’ve done to get you where you are right now. Make up your mind to finish well this summer. Your future self will thank you! And in honor of July 4th, you can get my 21 Day Metabolism Jumpstart Plan for 50% Off until midnight Sunday, July 8th! (Reg: $79 Now: $39.50) Use Discount Code: JULY4 on the checkout page. DISCLAIMER: This content is not intended to diagnose or treat any diseases. It is intended to be provided for informational, educational, and self-empowerment purposes ONLY. Please consult with your wellness team, and then make your own well informed decisions based upon what is best for your unique genetics, culture, conditions, and stage of life.